So I sat here for about 10 minutes writing and then re-writing the perfect intro paragraph to what, I feel, is one special recipe. I came at it from a few different angles, but nothing seemed to stick. And then it hit me - some things simply need no introduction. 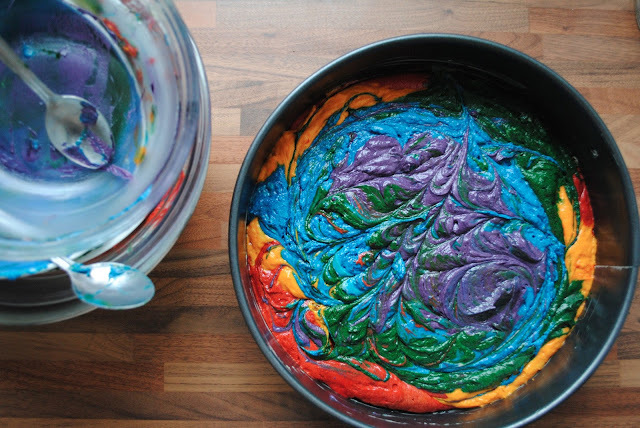 This is a freaking rainbow cake. Isn't that enough? It's basically the happiest thing you can think of, baked into the tastiest thing you can think of. It's like magic. Happy, tasty magic. I hope you enjoy it. There's no rocket science here, just your basic vanilla sponge cake recipe. Start by preheating your oven to 160C and lining a cake tin, preferably spring-form, with greaseproof paper. In a large bowl cream 225g unsalted butter with 225g caster sugar, using a electric hand mixer to get a smooth mixture. In a separate bowl combine 210g self-raising flour, 25g cornflour and a teaspoon of baking powder. Add four eggs to the butter mix, one at a time, alternating with the dry ingredients. Finally add about a teaspoon of vanilla extract and three tablespoons of milk. Fatboy prefers whole milk. Be careful you don't overbeat the mixture or your cake will have no air left in it and it will be RUBBISH. Separate into six different bowls, for six different colours, you dig? Everyone remember the rainbow song? No me neither. I remember ROY G BIV though. Red, orange, yellow, green, blue, indigo, violet. Indigo and violet...they're pretty much the same thing right? That leaves us with six colours. This is some powerful stuff, a teaspoon of each should do the trick. A bit of blue and a bit of yellow = a bit of green. Note the Fatboy modelling the men's version of his very own apron. Shoutout to the 190 boys for a very awesome engagement gift. Blue on blue. How about that? How about that for 6 bowls of beautifully coloured batter? You know what this stuff reminds me of? You ever see that scene in Hook when the Lost Boys have to use their imagination to fill their plates full of food, and then they have a big food fight and it's basically this colourful gooey stuff? Yeah, no my girlfriend hasn't seen that movie either. Watch it, trust me on this. RU-FI-O! And all you gotta do now is dump (not so much of a cooking term) the batter in layers on top of each other. Look at that red. Look at it pop. A bit of orange for you? Eh? You like that? Blue. We're almost there, don't worry. And to top it all off a nice bit of purple. Purple. Nothing rhymes with purple. Mad ey? No. Not really. Run your spoon through the cake batter to give it a nice swirly, marbled effect. Just look at all of those dirty dishes. Someone's going to have to clean those you know. So bake in the oven for about 25 minutes or so - you'll know it's done when a skewer inserted in the centre comes out clean. Let the cake cool and then whip up a simple buttercream icing. Mix together 110g unsalted butter, 60ml milk, 1 teaspoon vanilla extract and 250g icing sugar until you've got a nice smooth mixture. Add another 250g icing sugar and beat well until you've got a big bowl of smooth, creamy awesomeness. Dollop on the cake, spread and rejoice. Your rainbow in a cake is complete. Check out those multi-coloured crumbs. There's definitely nothing better than showing up to a party with this cake, then slicing it open to reveal the rainbow inside. Magical.